When you invest in any new marketing initiative, you need to be sure it produces results for your company. Even though most marketers believe in the impact of content, many find it hard to measure the ROI of this approach. In fact, while more than 90% of marketers use content marketing, only 21% of B2B marketers and 23% of B2C marketers say they’re successful at tracking return on investment. Even if you understand the advantages of content marketing, you’re risking your internal capital if you undertake a project without knowing how to effectively measure its success. Without a rough estimate of what constitutes success, you’ll be forced to rely on vanity metrics such as shares and views as proxies for performance. This could ultimately lead to resources being shifted away from content-focused marketing efforts in favor of initiatives that provide concrete returns. Content plays a distinct role in the sales process, and it provides incredible value for your overall marketing strategy and business. Despite the proliferation of digital advertising such as paid search, a study by Kapost and Eloqua found that content marketing ROI outweighed paid search ROI by more than three times. But without measuring the impact that content has on your organization, you’ll have no way of knowing where opportunities lie. 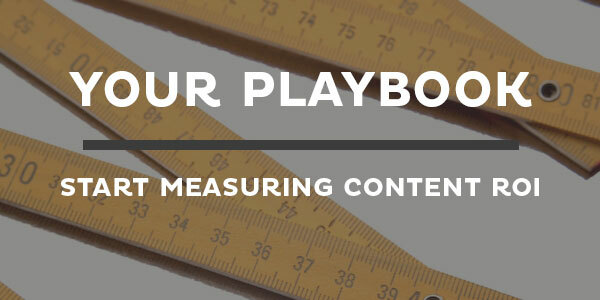 To unlock the value of the content you’re creating, you need a reliable system for tracking ROI. Like any investment, you’ll adopt the basic formula of (Gains-Cost)/Cost. In the context of content, you’ll take the revenue you can attribute to content and subtract the total costs (content salaries, technology, and paid promotion). Then you’ll divide the resulting number by the total cost. But before you can apply this formula, you’ll need to assign value to your “gains.” The trick here is to identify revenue that’s attributable to content. 1. What Leads and/or Sales Can You Attribute to Content? Typically, leads are counted and measured within marketing automation software such as Marketo or Eloqua, or a CRM such as Salesforce. These software options will give you hard numbers to work with, so it’s important to familiarize yourself with them. 2. What Value Does Marketing Deserve for Generating Leads vs. Closing Leads? Your team will need to decide how you’ll assign value for generating leads versus closing leads. It’s a good idea to have this conversation when making annual plans for marketing and sales strategies. From there, you can establish a starting value for the leads that marketing generates, versus the ones you can attribute to sales. It won’t be perfect and this will be an ongoing conversation, but it’s a start—and a basis for learning and refining your strategy. 3. How Do You Qualify Awareness and Brand-Building Effects? Branding and awareness are difficult to define, and calculating their value only adds to the complexity. But even assigning rough values will help you piece together the bigger picture. For example, say you convert 0.01% of all visitors to your site, and your typical sale is $1,000. Assigning $0.10 to each new visit your content generates is a great starting point. Your measurement strategy will depend on your goals and objectives, but when assigning value to content, it’s crucial to consider the customer journey. While blog posts and external articles tend to target top-of-funnel leads, downloads (especially gated content) appeal to leads at the bottom or middle of the funnel. And as leads move closer to the sale, your predictive quality and ability to assign a dollar value will sharpen. Blogging is a great way to guide leads through the sales funnel, but measuring the ROI of each post has traditionally been a challenge. By using marketing technology that measures the business impact of content and tracks leads and conversions from specific assets, you can drive more traffic to your site, engage leads through every phase of the customer journey, and see your ROI come to life. Just look at the online retailer Zagg. It has three paid writers who publish 25 to 35 posts each week. These posts speak to the company’s tech-savvy audience, and the investment has clearly paid off. In fact, 60% of its blog traffic comes from new visitors, and its blog delivers 10% of the site’s traffic and a 172% return on investment. Content is the ultimate lead generation and branding machine. When you take the time to effectively measure results, you’ll discover that the benefits far outweigh the costs. But you won’t realize the benefits unless you know how to track the ROI of your content marketing.